DONETSK, Ukraine -- The fighting has subsided, but Donetsk is quickly sinking into the past — a shabby Soviet-like state of empty streets and deprivation. In this photo taken on Tuesday, Oct. 27, 2015, people pass by the Soviet Union's flag and symbol center, and a Russian flag, right, painted on the gate of a TV company in Luhansk, eastern Ukraine. The fighting has subsided, but Donetsk is quickly sinking into the past, a shabby Soviet-like state of empty streets and deprivation. Huge portraits of Josef Stalin hanging in the city center only reinforce the impression of failure. Huge portraits of Josef Stalin hanging in the city center only reinforce the impression of failure. The wounds are raw in the capital of eastern Ukraine's pro-Russia insurgency and its prognosis not encouraging, even without the artillery barrages that terrified the city during the height of fighting between separatists and Ukrainian forces. Only three years ago, Donetsk was proud of the glitter it showed to spectators at the European soccer championships. There was a brand-new international airport, luxury boutiques and expensive restaurants. Now, the airport is a grotesque ruin, destroyed in one of the longest, most grisly sieges of the war. The shops and eateries are mostly closed — and even if someone were feeling flush, there are no working ATMs to feed them cash. "It's been a terrible dream; life was turned upside-down in a couple of years," said 34-year-old resident Sergei Debenko, who lost his rebel fighter brother in the war. Donetsk's people today live in limbo. Effectively, they're no longer part of Ukraine, but Moscow has refused the rebels' pleas to be incorporated into Russia. Ukraine clamped down on the rebel-held parts of the Donetsk region and the neighboring separatist Luhansk region with a choking economic blockade; pensions and social benefits were cut off and business contacts frozen. Humanitarian convoys from Russia bring in food and medicine, and international groups also scramble to supply the region's people with medicine. Russia is also paying pensions and benefits, and salaries are paid in rubles rather than the Ukrainian hryvna. But salaries and benefits are often months in arrears and tiny when they finally come. Vadim Medchenko, an unemployed Donetsk resident, said he, his wife and infant child survive on 1,500 rubles ($25) a month in child-support payments. Along with the economic blockade imposed by Kiev, there are also laborious transit regulations for Donetsk residents who want to travel to government-held territory to scrape together a better life. Painfully long and slow lines form at border crossings. Some people stand for two days or more at checkpoints, before they can cross into an area where the food is up to three times cheaper than in Donetsk. For the officials of the Donetsk People's Republic, as the rebels call themselves, it is a tenuous existence. "We have no annual budget. We form a budget for a month," Ekaterina Matyushchenko, the finance minister, told The Associated Press. 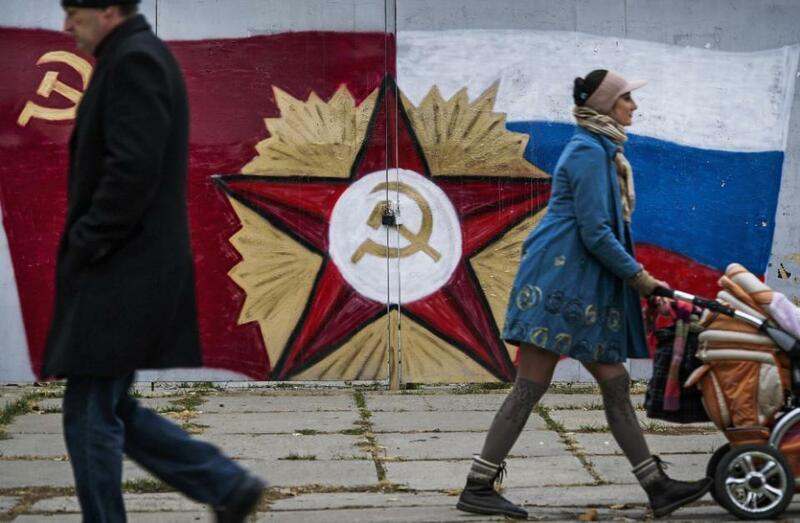 Many Donetsk residents say there's only one way out — to become part of Russia. "We don't have a road to return to Ukraine. We are too different," said high-school teacher Alla Andrievska, who earns 3,000 rubles a month, when she's paid at all. Her history classes fortify that belief, using Russian textbooks that echo Moscow's contention that the 2014 protests that drove out the Russia-friendly president and precipitated the fighting in the east were a "putsch." Marchenko, the unemployed man, also sees joining Russia as inevitable. "We are part of the Russian world," he said. But Russian President Vladimir Putin, whose economy took a severe blow from Western sanctions over the Ukraine crisis, is showing no sign absorption could happen. And Ukraine crisis, which once topped Russian newscasts, now takes a back seat to Russia's airstrikes in Syria. Many analysts think Putin has a different end-game in sight. "The Kremlin wants the (rebels) to get maximally wide representation in Ukrainian structures, and then to use them to make a constant dig at Kiev," said Volodymyr Fesenko of the Penta analytical center. "De-jure it will be Ukraine and de-facto it will be Russia: a frozen conflict." In spirit, it is already Russia. There's little left of the Ukrainian past in Donetsk, aside from an outlet of the well-known Lviv Chocolate Studio, and here it doesn't sell one of its most famous products: comical chocolate figures of Putin.